As one of the biggest industry events in the UK, Smart IoT London is a blast every year. Featuring gripping seminars and awesome tech displays around every corner, it’s the gathering place of hundreds upon hundreds of IoT’s greatest minds; and a top destination for businesses looking to start their digital journey or soup-up their digital offering. We make a point of going each year in order to contribute to London’s IoT conversation, cultivate innovation, and pinpoint opportunities for our new and potential partners. And as Pangea’s Ops Director, I was more than a little curious to see how the latest IoT tech and trends manifested on IoT London’s event floor. From digital disruption and drone tech to AI-run smart cities, there were a plethora of thought-leaders diving into their areas of expertise and sharing insights with attendees. Having just returned from Mobile World Congress in Barcelona, it was good to see the themes of IoT, AI, and Big Data thread through into a regional event such as IoT London. One standout talk, titled “How IoT and AI is transforming our daily lives” and delivered by Remy Mandon, the VP of IBM’s Watson IoT platform, featured a survey of 3500 C-level executives across various companies within and without the Channel. The results illustrated what drives decision-makers to integrate IoT and AI into their businesses, with answers ranging from pressure from external sources to a desire for greater business efficiencies. Remy also delved into harnessing data through IoT and unlocking new business value through AI; all key themes in digital transformation for businesses and crucial points for companies looking to blaze a trail in their industries. Another top seminar was delivered by Julian Scriven, the MD of Brompton. Creatively titled “Session delivered by Brompton Bikes”, it covered IoT’s growing role in manufacturing processes and quality control. With Industry 4.0’s booming influence extending its reach across many sectors, this talk in particular drew me in; and not just because I’m an avid Brompton lover. 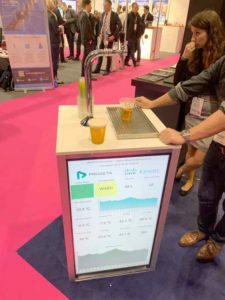 Of course I couldn’t pass up the chance to check out the IoT beer tap—an unforeseen rarity at 11am in the morning (although I gracefully refused at that point in time, rather returning at the end of the day to partake in some beverages straight from the Czech brewhouses). Having previously concocted a smart beer solution ourselves, it was great to see the idea gathering momentum. It’s no wonder it’s an area of focus for hardware distributors—equipping service industry players with powerful analytics-gathering capabilities (along with precision-pouring and customisable foam) opens up serious savings potential; it’s a no-brainer! And if you’re crafting an IoT solution that manages to both stimulate the brain and satisfy the stomach at the same time; more power to you, I say! We’re facing an incredibly exciting time in the industry, and as the tenets of Intelligent Connectivity transition from conceptual to concrete, it’s important for partners to consider each IoT solution holistically, and ensure all facets are delivered effectively. Not only do the device and connectivity at the bottom end need to be top-notch; the big data they generate needs to be accessible, applicable, and immediately valuable in order to secure maximum ROI. In a few years, AI systems and devices will be commonplace; and we’re on the cusp of IoT merging with AI and big data. Yet often, these innovative advancements are shadowed by security compromises such as botnets, ransomware, and DDoS events. It’s good to see that IoT security is seeing investment and getting the coverage it deserves. However, you can never have too much security. On a device level, companies are building security modules to integrate into existing router firmwares to secure data end-to-end, and detect suspicious traffic and activity. On a network level, companies such as ourselves are supplying partners with pipes such as IPSec VPNs to keep cellular data traffic off the public Internet, and to ensure it routes only to its intended destination and nowhere else. Partners—stay aware of developments in these spaces by joining us at events like Smart IoT London. And don’t forget to subscribe to our newsletter for firsthand access to our event reports, trend analysis and tech spotlights!